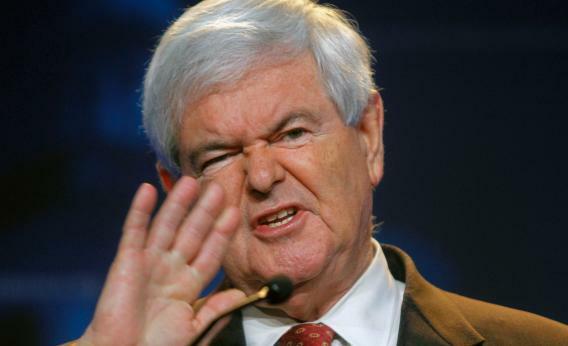 Newt Gingrich and Trayvon Martin: Is it OK to identify with Christians but not blacks? Gingrich says it’s wrong to identify with victimized blacks. But it’s fine to identify with victimized Christians. Republican presidential candidate Newt Gingrich in Pennsylvania on March 24. Photograph by Jessica Kourkounis/Getty Images. Read Slate’s complete coverage of the Trayvon Martin case. Newt Gingrich says it’s disgraceful of President Obama to express a feeling of kinship with Trayvon Martin. It’s wrong, according to Gingrich, because it divides Americans into groups and implies that Obama would be less sympathetic to a white victim. An argument for impartiality in the Martin case can legitimately be made. But it can’t be made by Gingrich, because he’s an enthusiastic practitioner of identity politics. It’s just that the victim group with whom he chooses to identify is Christians, not blacks. When I think about this boy, I think about my own kids. And I think every parent in America should be able to understand why it is absolutely imperative that we investigate every aspect of this, and that everybody pulls together—federal, state, and local—to figure out exactly how this tragedy happened. … But my main message is to the parents of Trayvon Martin. If I had a son, he’d look like Trayvon. And I think they are right to expect that all of us as Americans are going to take this with the seriousness it deserves, and that we’re going to get to the bottom of exactly what happened. What the president said, in a sense, is disgraceful. It’s not a question of who that young man looked like. Any young American of any ethnic background should be safe, period. We should all be horrified no matter what the ethnic background. Is the president suggesting that if it had been a white who had been shot, that would be OK because it didn’t look like him? That’s just nonsense dividing this country up. So Gingrich is against dividing us into groups and identifying with victims who belong to one group. Right? If they’re the Saudis, who demand that we respect them, while they refuse to allow either a Jew or a Christian to worship in Saudi Arabia, that’s something different. And I think we need a president who stands up, tells the truth, and rejects any kind of effort to impose on us a sense of guilt because we believe in our religion and we’re prepared to tell the truth. From my perspective, you don’t have an issue of religious tolerance. You have an elite which favors radical Islam over Christianity and Judaism. You have constant pressure by secular judges and by religious bigots to drive Christianity out of public life and to establish a secular state—except when it comes to radical Islam, where all of a sudden they start making excuses for Sharia, they start making excuses that we really shouldn’t use certain language. The key shift here is the segue from foreign to domestic matters. When Gingrich talks about judges imposing a secular state, he’s not talking about Saudi Arabia. He’s talking about the United States. He’s telling Christian listeners that the government is persecuting them while favoring Muslims. When churches are burned in Nigeria, do we get an apology? No. When churches are burned in Malaysia, do we get an apology? No. When churches are burned in Egypt, do we get an apology? When the Saudis refuse to allow a church or a synagogue in the entire country, do we complain about religious bigotry? The curious connection Gingrich draws here is between churches and we. The Christians who lost their churches in Nigeria, Malaysia, and Egypt weren’t American. Why, then, should “we” get the apology? Who, in Gingrich’s view, is “we”? Is it Americans? Or is it Christians? What’s telling here is Gingrich’s abandonment of the “radical Islam” formulation for a franker attack on “the Islamic frame” and “apologizing for Islam.” That, combined with the allegation that Muslim-lovers are “dissing Christianity,” sets up an explicit conflict between Muslims and Christians. Look at the new show that’s on that has the word “Christian” in it, and I want you to take the exact name, drop out “Christian,” and put in “Muslim.” And ask yourself: Is there any network that would have dared to run a show like that? And you know the answer is not a one, because anti-Christian bigotry is just fine in the entertainment industry, but they have to be very protective of Islam. Gingrich has a point about the show’s offensiveness to many Christians. But why bring Islam into it? Why complain that the media are so “protective of Islam”? It’s hard to explain this without seeing in Gingrich’s comments an attempt to bond with fellow Christians in resentment at an alien faith. Let’s accept that he’s [Obama] a Christian. He’s a Christian whose policies are to apologize to Muslim extremists while they’re killing Americans, at the same time that he’s waging war against the Catholic church and against every right-to-life institution in this country. I just went today to Louisiana College, which is a Baptist college, which is very right-to-life. The president said publicly they will close the university before they will give in to Obamacare because they’re not going to provide abortifacients to their students or their employees. Now, you tell me. Let’s accept he’s a Christian in his own light. He went to a Christian church for over 20 years. Why is it he’s more sensitive to radical Islamists who are killing young Americans than he is to the Catholic Church, to Baptists, to fundamentalists? In Gingrich’s world, it’s fine to divide the country into groups, identify yourself with one group, and complain that your group is being persecuted. But only if you’re in the majority.